2019 is the DA,s 110th anniversary. The DA and Luss site manager would like to thank all the volunteers giving up their time on the work party for a job well done. This is a memo from our chairperson Carol Etherson regarding our celebrations. "We propose to start our birthday meet on Friday 24th May with a cheese and wine in the evening. On the Saturday we are BBQing. Food is what Glasgow likes doing best! On the Sunday we are hoping for fun sport activities, e.g. waterslide etc. During the week following the ideas are; going to Glasgow to go on the bus tour of the city, birds of prey exhibition, bird talk and slide show, visit to local distilleries and microbrewery, entertainment to give us an excuse to have oat cakes and haggis, a walk in surrounding area. To end the week a formal dinner dance and ceilidh in a hotel [Royal] within walking distance on the 1st of June that needs to be booked as we have a limit as to how many the hotel can take. We are hoping to get enough drivers so we can hire a minibus to take people to some of these events." We are still looking for stewards. Do you feel you can steward a meet to help your D.A. keep our excellent meets to continue? We urgently need your help to save some of our meets being cancelled, please don't let this happen. 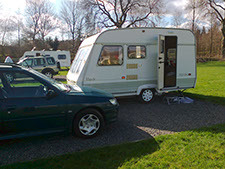 If you are new to the club or even new to camping or caravanning this is the club for you. We love to give new members to the Glasgow DA a warm welcome into our throng of happy campers.